← We Made It to Chennai! 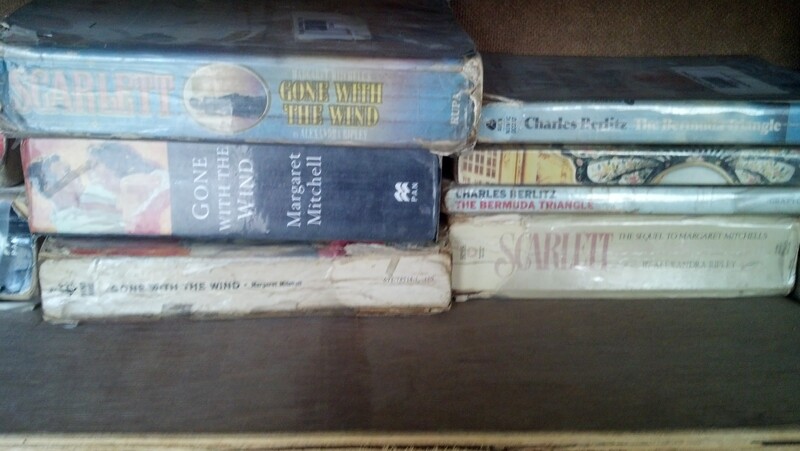 It did make me a little insecure to leave home relying on my phone and e-books for my principal reading material. But today Brianna and I stumbled across a goldmine: the Renga Lending Library. We had walked the half mile or so from our hotel to the neighborhood market to pick up three altered outfits from the tailor (they weren’t ready) and walked on through the market in search of notebooks and hair pins. 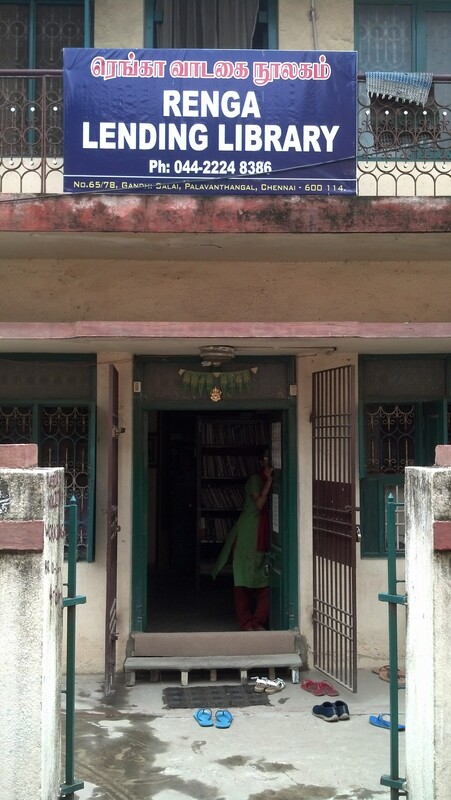 That was when the Lending Library sign caught my eye and lured me into the alley where we found this two-story building. We didn’t spend much time in the downstairs Indian-languages section, but the English-language collection upstairs was well stocked. Judging by the condition of the books and the steady stream of patrons during the half hour we were there, the library is well used. 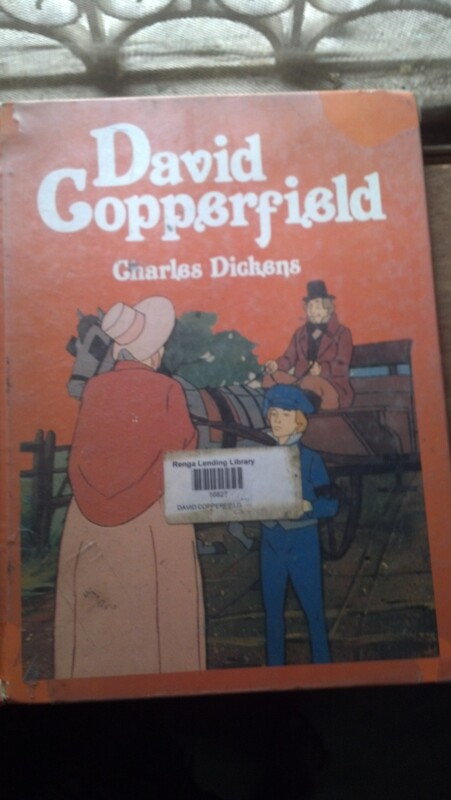 David Copperfield, adapted for young readers. 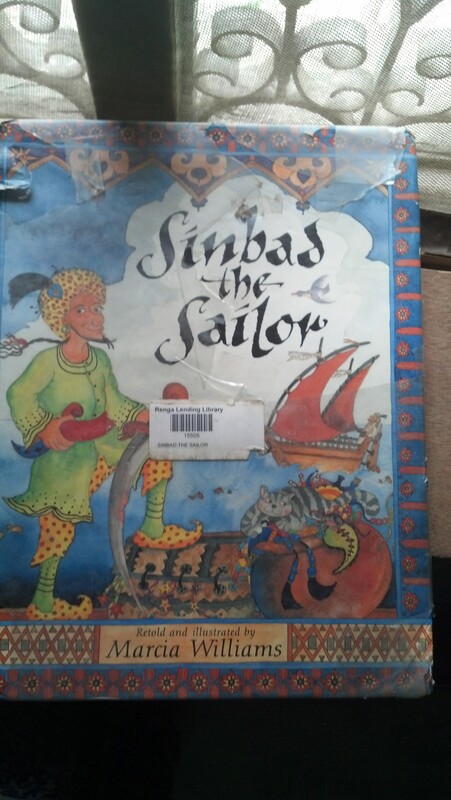 Sinbad the Sailor (which we read last month in a different adaptation) by my favorite redactor, Marcia Williams. Her comic-book-style interpretations of classic literature are clever, artful, and engaging for young readers. We’ll have to get this one for our homeschool history lessons. Other children’s book selections of interest were shelves and shelves of Nancy Drew, The Hardy Boys, and books by British author Enid Blyton; Hitty, Her First Hundred Years (a childhood favorite of mine); Madeleine L’engle, Beverly Cleary, the Baby-sitters Club, Magic Treehouse, and a shelf of Meg Cabot (Princess Diaries). The whole time I was browsing, Brianna sat and read a Mrs. Piggle Wiggle book (another childhood read I’ve been wanting to introduce her to). And we were excited to find Laura Ingalls Wilder’s By the Shores of Silver Lake, as we were reading the previous book in the series, On the Banks of Plum Creek, before we left home. I also found a collection of Archie comic books and what appears to be an Indian comic book series–Tinkle, published by India Book House. 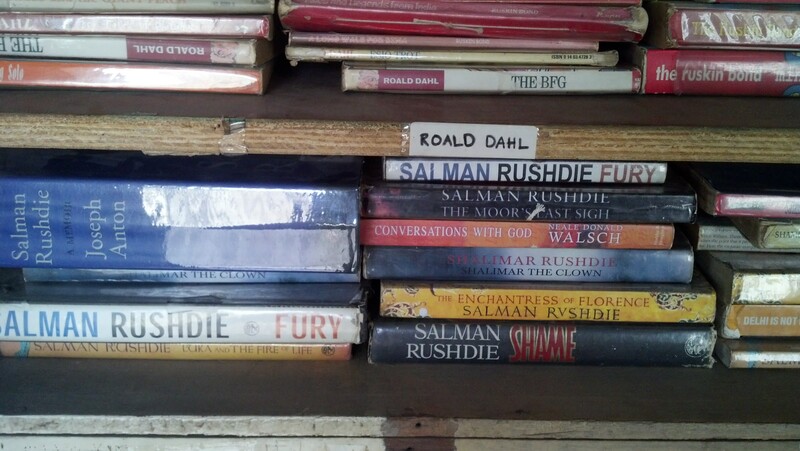 A whole shelf of Salman Rushdie–no surprise. But I was amused to find it topped by a copy of The BFG by Roald Dahl, which Brianna has read twice at school without me. Now’s my chance. 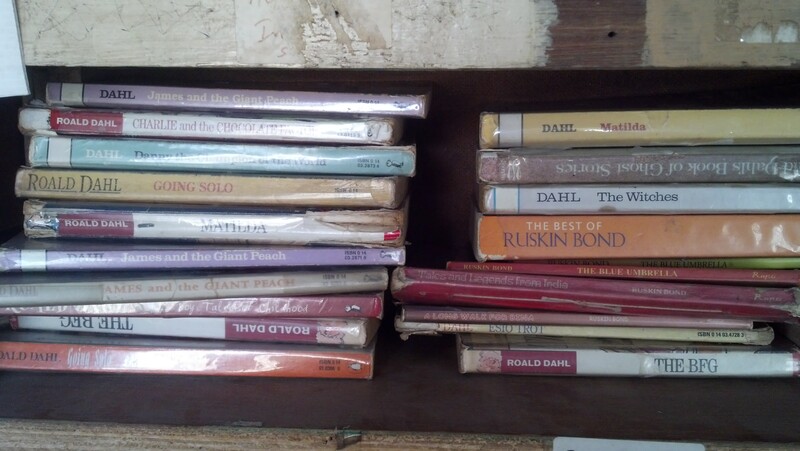 A shelf of British humorist P.G. 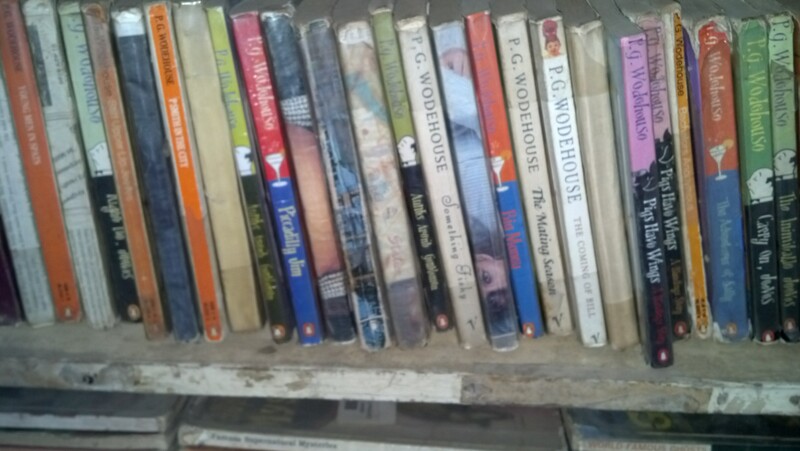 Wodehouse, whom our Scottish friend in Tajikistan introduced us to more than a decade ago. 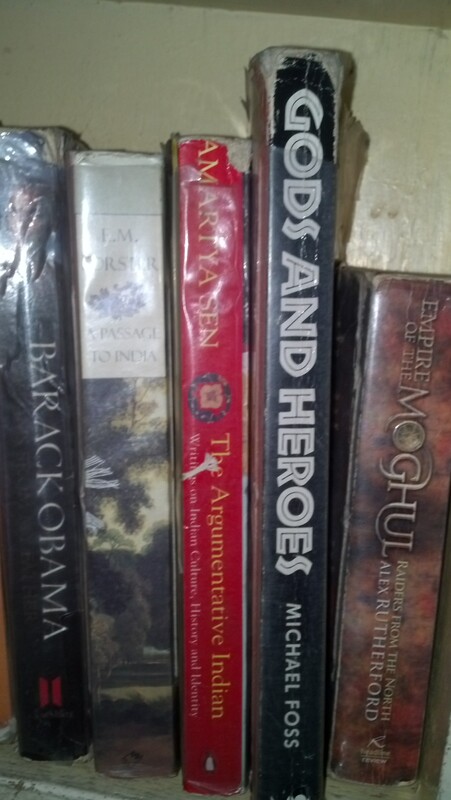 I found his books even more entertaining later on audio. Barack Obama and E.M. Forster’s Passage to India. And some slightly less Western titles, including books by Yann Martel (Life of Pi), and Rohan Mistry, both award-winning Canadian writers. The fictional Life of Pi concerns an Indian family, while Mistry is originally a native of Mumbai. Amitav Ghosh is a highly acclaimed author born in Calcutta and growing up in India, Bangladesh, and Sri Lanka. In general, the books seemed to represent a “Who’s Who” of Western 19th and 20th-century literature: Agatha Christie, James Michener, Milan Kundera, Ray Bradbury, Ernest Hemingway, Leo Tolstoy, Franz Kafka, George Eliot, Oscar Wilde. Some additional Eastern representatives included Khalil Gibrah, Deepak Chopra, Siddharta Mukerjee, Jhumpa Lahiri, and a collection of religious books: the Mahabaharata, Ramayana, Rig Veda, Bhagavadgita, and a few books on Islam. Several series not to be overlooked: Chicken Soup for the Soul, Khushwant Singh Jokes, and Rugby Jokes. And finally: The World is Flat, by Thomas Friedman. We weren’t able to check out any books because we didn’t have proof of residence. But I plan to return as soon as possible with Brian’s official letter of invitation and pay the membership fee of 300 rupees (about three dollars), after which we’ll be able to bring home Sinbad and David Copperfield, for starters. 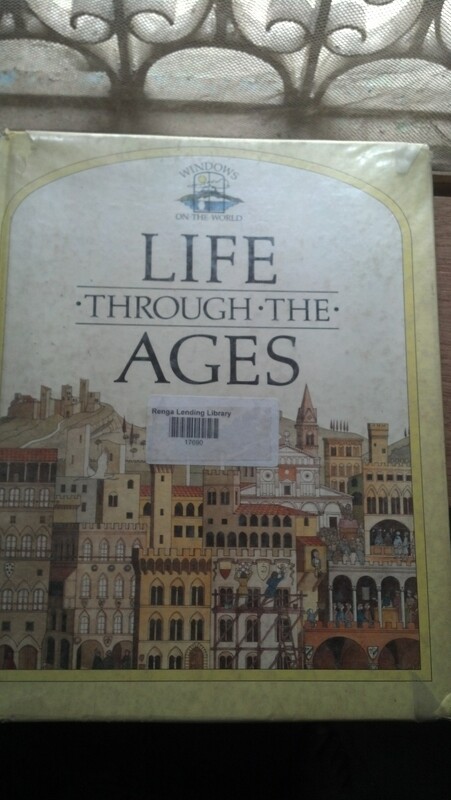 This entry was posted in books, Chennai, India, libraries and tagged books, Chennai, India, libraries. Bookmark the permalink. I don’t know the answers, but I would like to find out those and more. The librarian wasn’t there. I hope to get more information when I go back. What?! 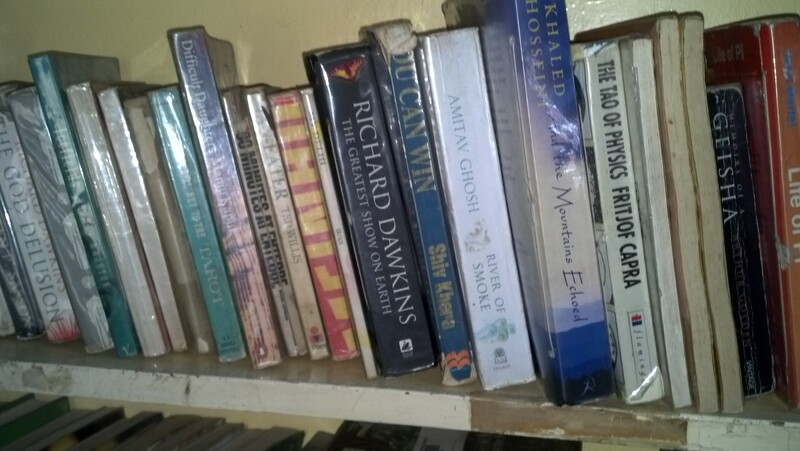 A lending library lacking Bill Bryson titles? Perhaps the Chennaites should seek a relaxing pause from the usual local hubbub to take a walk in the woods. 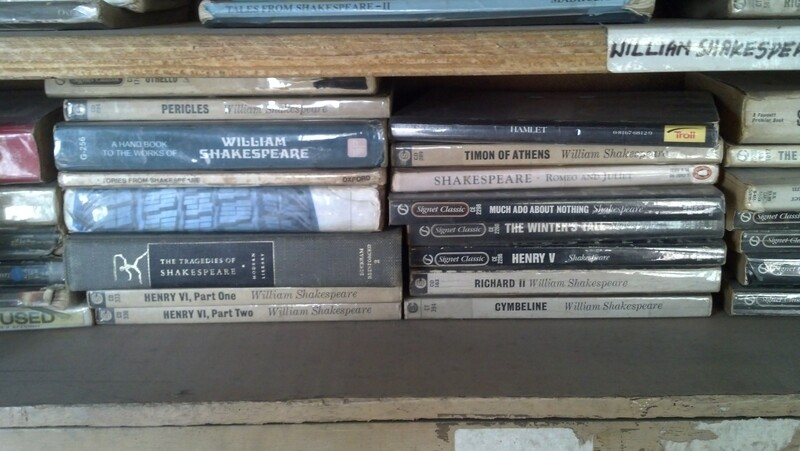 And no John Steinbeck titles? Of mice and men and Chennaites, all should read through Steinbeck’s emotional, engaging novels — each a literary pearl waiting to be discovered.